Parallel universes exist. I found three of them today, and I’m calling them the Crow Trio. They exist on the local golf course, on an old stately tree with roots tapping into the nearby creek. These worlds are home to spiders and mites and insects and beetles — some so specialized they can only live inside a single pore on these fungi universes. While the Crow Trio may appear small to the likes of humans, they are each complete, life-sustaining habitats. And that’s pretty awesome. Here’s the thing. Once shelf fungi, also called woody shelves, show up, it’s pretty much the beginning of the end for the host galaxy, or tree. Why? Because they’re a sign of rot. Not that it’s all bad, and that’s really part of the reason I’m grateful. Because it’s just a sign of life, going along as it should. 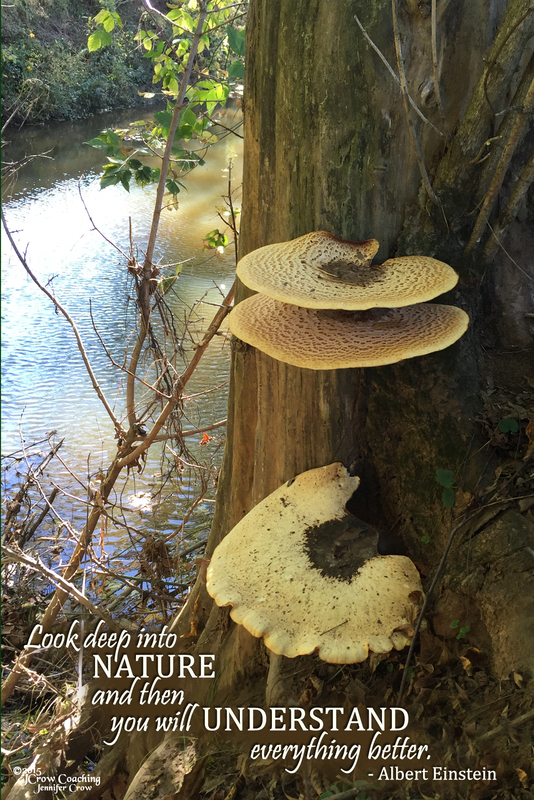 Shelf fungi may signal rot, but they also provide nesting sites for birds and squirrels — nests that are easier to excavate thanks to the softened wood. And while limbs and trees buckle, sag, and break, bunches of woodland creatures find protective habitat and cover amid its rotting body. It’s symbiotic. So today, I’m grateful to have seen these woody shelves at all, hidden as they were down an embankment. But even more than that, I’m grateful for the role they play and the life they sustain, not only for the denizens of their very specific universe, but also for the creatures who benefit from the fact these tiny universes exist at all. It’s a crucial lesson of inter-dependency. We are not alone in this world, in this galaxy, in this universe, although we act as though we’re the only things that matter. I am grateful for this message: I may simply be a resident of some small galaxy stuck to the side of some dying galactic tree. And that’s a humbling thought.